Look! A Moose, a Nerd and me! OK, I lied. I never got around to posting anything today. But I did get a picture put up on Flickr (and realized that I didn't have a Moose set on Flickr yet! The horror!). 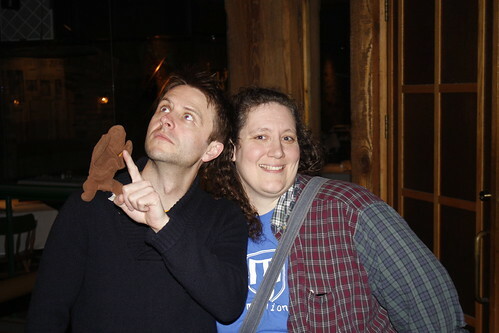 So here is a picture of me and the Fabulous Moose with the super awesome, funny, and adorable Chris Hardwick, aka Nerdist. Even tough I'm not totally thrilled with this picture it is MUCH better than the first try. I love my hellbob, but he's really not that good at taking pictures of me with other people. I have no idea who the Nerdist is but you look cute! And Moose of course is handsome as always. You were talking about Hera the other day, sorry I never got back to you about that. Just remembered now when I saw what you were listening to. You know, I'm pretty sure I did talk about her at some point but if I did it was before tags came on LJ. So, pretty long ago. She is one of my favourite singers. I had a song of hers in my "In a Mirror Distorted" soundtrack. She has such a sweet voice and rather quirky lyrics. I'd love to check out the Icelandic stuff. We were already going for a second try. I wasn't going to make the poor guy wait while I said "Stop. Honey, can you look a little less crazy?" and then have that argument? I said it was better than the first try! you got his email? totally jealous. he's really quite funny and cute in person. i've not has the pleasure of seeing his standup, but i went to several websoup tapings last year. he totally gave me a hard time for knitting, but then took a funny picture with my unfinished scarf afterward. If I lived in L.A. (or wherever it is that Web Soup is taped) I'd totally be going to as many tapings as I could! We got G4 back on our cable!!!!!!!!!!! When we downgraded to the basic digital package G4 wasn't included, so we couldn't get Web Soup. Earlier this week we noticed that the Tivo was recording it again. Comcast added it to the package we get!!!!!!! Out of all the channels we weren't getting anymore, Web Soup was the only show we were really missing. oh that's cool that he'll help out with the silent auction. he does seem like a pretty awesome dude. yes la is where it's taped. right down the street from where i work. i have a ridiculous amount of cable channels because i end up watching a lot of movies while boy sleeps. stupid night schedule.